Dude, what a total bummer. You're really rockin' the haiku! 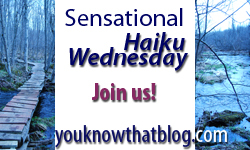 I love how you tie in the haiku and Wordless Wednesday photo. Fun stuff, you! to the max, you know? Cool picture, looks like a fun party!